After days of teasing, Amazon’s Prime Day sale is finally here. The sale kicks of today and will go on for 36 hours. In this particular last, we’ll be looking at some PC accessories that are available at pretty impressive prices. So without further ado, let’s get to it. The Bose QuietComfort 25 is an over the ear headphone that offers active noise cancellation. The headphone is available in two variants, one for Android devices, and another for iOS, so make sure you pick the right one.Click here to buy. The F&D A110 2.1 Channel Multimedia speakers can connect to you PC, TV or a MP3 player. The speaker is said to deliver 3000W PMPO, while the wooden cabinet reduces sound distortion.Click here to buy. If you are willing to splurge, then you can take a look at the Bose SoundTouch 20 Series III Wireless Music System. The system connects to the home Wi-Fi and also works with Bluetooth. It also offers one-touch access to music services like Spotify and Pandora. Users also have access to internet radio and music library playlists.Click here to buy. If you want to carry around a lot of your data, then a portable hard disk is your best bet. This WD My Passport external drive offers a whopping 4TB of storage which is more than enough for most, if not all, your needs.Click here to buy. If you have a tighter budget, then the 2TB Seagate backup Plus Slim drive might just fill the bill. The drive offers USB 3.0 connectivity and also comes with 2 months of Adobe's Creative Cloud Photography Plan.Click here to buy. If you’re looking for a way to expand the storage of your smartphone by a lot, then you might want to take a look at the SanDisk 128GB Class 10 microSDXC Memory Card. This card also comes with an adapter, so you can also use it with other devices.Click here to buy. The TP-Link Archer C20 AC720 is a dual band router that supports 802.11AC standard, with simultaneous 2.4GHz 300mbps and 5GHz 433mbps connections for 733mbps of total available bandwidth. It should be noted that the router does not include a modem.Click here to buy. If you’re looking for a sleek router, then you might want to take a look at the Xiaomi Mi 3C Router.The router has four antennas, with two antennas dedicated as receiver and two antennas dedicated as transmitter, which should help with lower interference and better speed.Click here to buy. 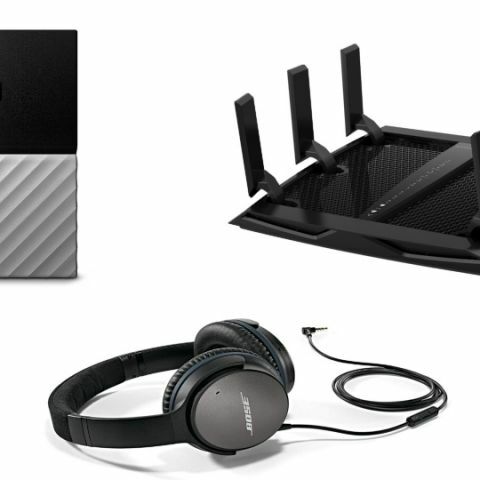 If you are really serious about your router, then take a look at the Netgear AC3200 Nighthawk X6. The Tri-Band Wi-Fi delivers more Wi-Fi for more devices while six high performance antennas and powerful amplifiers maximize range. There is also a Smart connect designates slower and faster devices to separate Wi-Fi bands.Click here to buy. The Canon Pixma E477 offers scanning, printing and copying with the same device. Further, the printer is Wi-Fi enabled, so you can send from prints using a smart device like your smartphone.Click here to buy.